My students had been asking, all semester, about when I was going to grill out for them. I think they were joking, but my small New Media class was the right size for a nice May cook out. I thought, "Yep. Let's do it." Initially I was going with hand patted hamburgers and hot dogs, but one student asked about bringing some chicken. I told her that I'd just change the menu. Grilled boneless chicken breasts or tenders are easy. The chicken was even more popular than the hamburgers with this crowd. I think I will have to give the credit on that to the sauce, Firefighters Barbecue Sauce. That was a real hit. It's tangy and works great on chicken or anything else that you might barbecue. 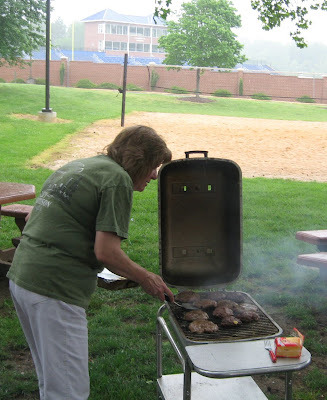 I did the burgers on the Portable Kitchen PK charcoal cooker and the chicken on the City Grill. With two meats going at once and chicken more delicate, I wanted better heat control, so gas made sense for the chicken. The charcoal added flavor to the beef. It adds flavor to chicken as well, but the trade off on convenience was a good idea especially since it rained while I was grilling. 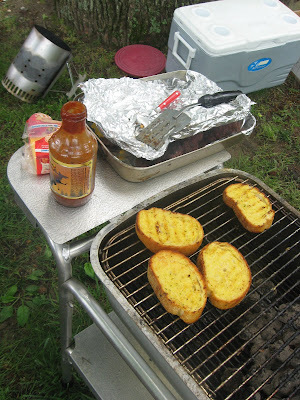 The Portable Kitchen Grill is cast aluminum, so it has excellent heat retention. 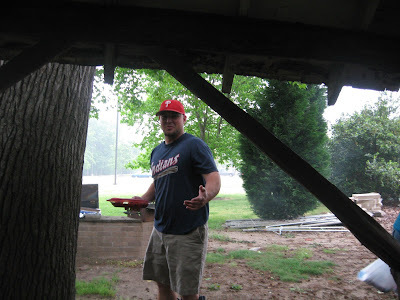 That's good, because we had a gully washer right as the hamburgers started to sizzle. Rain drops the temperature and can also dampen the coals. By keeping the lid closed a good portion of the time, I was able to complete the grilling. A few burgers were undercooked, but the students just let me know, and we put those back on the grill for a couple of minutes. A good grill chef will roll with the punches and also make sure guests know that it's fine to speak up. If you have kids, you probably know this (-: Adults are more likely to keep quiet. 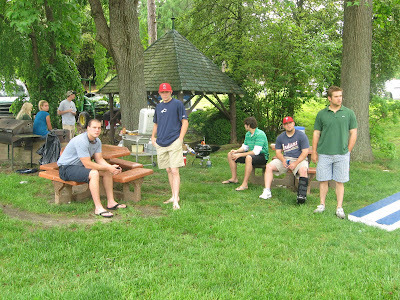 But, an interactive griller can get everyone involved and comfortable. All the students offered to help, and I took them up on it. There's a lot to carry and do at a cook out. Extra hands make a world of difference. I've never understood the "keep out of my kitchen" or "stay out of the grill area" mentality. I love the company and also fewer trips back and forth to the truck or kitchen. For dessert, I made homemade peanut butter fudge. That may seem a strange choice, since fudge is more often a holiday treat. My peanut butter fudge recipe is so quick (5 minutes on top of the stove), so when I need a splurge type dessert, that's what I make. It also ends up being the recipe I'm asked for most often.